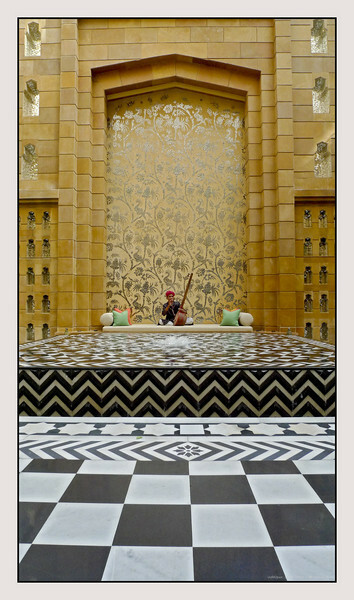 During breakfast a musician would play Indian ragas on the Tanpura at our hotel Leela Palace (Udaipur) . The raised platform in front of him had small fountain and the water flowed down from all four sides. Great photo! I love the different lines and the contrast from the b&w floors up to the wall. I love all the patterns. What a great setting for a musician. Neat shot and perspective, I like the patterns and colors! Great comp and love the musician.